In the essay below, Bruce L. Mouser, Emeritus Professor of History at the University of Wisconsin-La Crosse, describes the conflicting goals of African Creoles, African Americans, and British and American colonizationists in the fate of the Rio Pongo Valley along the West Coast of Africa. Mouser explores these conflicts in his history of the period called American Colony on the Rio Pongo: The War of 1812, the Slave Trade, and the Proposed Settlement of African Americans, 1810-1830. The Rio Pongo, on Africa’s western coast, was the center of an unusual history that briefly brought together slaveholders and colonizationists, Africans and African Americans, and British and American diplomatic interests in an attempt to decide the fate of the region. The slaveholders who were African and the white supporters of African-American settlement contemplated meeting in the unlikely setting of the Rio Pongo as each group sought to impose its vision on this small region of West Africa. The Rio Pongo, which had its origins in the highlands of Fuuta Jalon in what is now the Republic of Guinea, had been a hotbed of the slave trade since the early 1700s. It eventually attracted a number of European and American traders who set up permanent residence in the area, marrying or partnering into commercial families, some of which were aristocratic. Over time the descendants of these unions created a mixed-race Creole population and culture which effectively dominated the region’s commerce by the beginning of the 19th Century. These powerful Creole families, although rooted in the Rio Pongo, extended their horizons far beyond West Africa. Many of them regularly travelled the Atlantic trade routes between Liverpool and London, England; Charleston, South Carolina; Havana, Cuba; and the Rio Pongo. Some maintained separate residences and families in two or more of those places. Stiles Lightbourn, Paul Faber, and Zebulon Miller likely spent more time transporting goods across the Atlantic than they spent with family in the Pongo. John Fraser had families in Florida and the Pongo, while John Holman, Jr., owned and operated a plantation near Charleston while maintaining his principal residence in the Pongo. Daniel Botefeur maintained a separate residence and family in Havana. Many of these Creole traders became quite wealthy. They encouraged education for their children and allowed the London-based Church Missionary Society (CMS) to establish schools in the area while at first conveniently overlooking the economic activity and source of wealth of the parents of the mixed-race children they taught. This Creole elite reached the height of its power and wealth in the first two decades of the 19th Century. These families, however, owed much of their wealth and status to the Trans-Atlantic slave trade. By 1800, slave trading was an enormously profitable business on the Pongo River. Most market-bound slaves came from the interior and were brought coastward by caravans where they were exchanged for European and American manufactured goods. The world of these Creole families was challenged, however, when the Americans and the British in 1808 outlawed their citizens’ participation in the trans-Atlantic trade. Many of the Creole families who held American or British citizenship, waited to see how these new laws would be enforced. When it became evident that neither Britain nor the United States were willing to commit sufficient military resources to stop the trade, the Pongo’s Creoles became illegal traders. They continued their participation in the illegal trade until the early 1830s when the European market for African-grown peanuts, cocoa, palm oil, and coffee gradually made it more profitable to retain slaves as workers on plantations now established along the river to produce the new export crops. 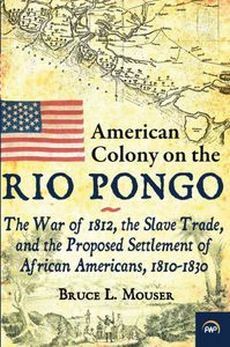 As the Creole families made the transition from slave trading (both legal and illegal) to legitimate commerce, the name for the emerging cash crop economies, American colonizationists increasingly looked to the Rio Pongo as a possible site for the settlement of African Americans. The first major resettlement proposal came from the American Colonization Society (ACS) when it sought a place to repatriate former slaves being freed by owners in the United States. The ACS at least initially included abolitionists who saw the settlement of African Americans in Africa as a way of undermining the illegal but still continuing slave trade. These settlers would, according to both abolitionists and advocates of colonization, bring Christianity, western civilization, and western-oriented legitimate commerce to the region. Since most of the settlers were former slaves, so the thinking went at the time, they would be far more likely to challenge slaveholding and slave trading in the region, thus accelerating the transformation to legitimate commerce. Others in the ACS had different ideas about resettlement, particularly by the 1820s. They saw repatriation as a way of ridding the United States of an inferior, troublesome population. They were less concerned about civilizing Africa and more concerned about removing from the United States a growing and potentially dangerous class of free blacks. African resettlement would solve that problem. ACS advocates, regardless of their motivation, already saw a fairly successful repatriation effort led by the British government in the creation of Sierra Leone. Since the beginning of the 19th century, Sierra Leone had been a welcoming place for blacks from Canada, Jamaica, and even England itself. By the 1820s the ACS had recognized Liberia as its version of Sierra Leone but they also admired the Rio Pongo as well, as a potential area of settlement of ex-slaves. In 1820, Colonization advocates located in Baltimore, Maryland, received an invitation from unidentified sources to establish a settlement in the Pongo. Jetties and wharfs of the area were already in place and capable of receiving large numbers of settlers. The area was sparsely populated. Good farm land was well-connected with trade routes that joined the economies of the interior to those along the coast. English was the principal language of commerce in the area as well as the tongue of the powerful Creole families. But there also were problems with the Pongo as a potential settlement site for freed slaves. While some of the river’s Creoles had abandoned slave trading, others had not. Slave trading might theoretically be illegal, but owning and using slaves in plantations was still legal and a number of elite Creole families owned or had the authority to command the labor of hundreds or thousands of workers, a circumstance that would surely affect the status of newcomers who, unlike Sierra Leone, which was a protectorate of the British Empire, had no political sponsors or military defenders since the American Colonization Society was a private organization not officially tied to the U.S. government. Moreover, these settlers would need to compete for wages in an area dominated by slaveholders and their slaves. More problematic was the future status of persons who had been slaves or whose parents had been slaves in the United States. In the Pongo, a person with that type of background was forever labeled a descendant of slaves, a status that had a legal impact on inheritance rights, property ownership, the type of work permitted, and membership in secret societies, all important considerations in the settler’s potential new home. International tensions between the British and American governments also impacted the future of black American settlement in the Rio Pongo. Any American design to establish a settlement for African Americans generated tension with the British. Although they had created Sierra Leone as a haven for British ex-slaves, the British government looked cautiously on an attempt to establish an informal American presence near their colony. British Royal Governors at Sierra Leone were well aware of Americans who regularly smuggled goods into Sierra Leone. They and other Britons were convinced that the United States was plotting to overwhelm British interests in the region by flooding the coast with American manufactures and African Americans. At first they were amused by the prospect of a colony of former slaves at the Rio Pongo but their amusement soon turned to horror at that prospect. Britain could tolerate an American settlement to its south (Liberia), but an additional one to its north (the Rio Pongo) seemed evidence of a planned encirclement. Thus three separate narratives, 1) the rise of the wealthy Creole societies that by 1800 dominated the Rio Pongo, 2) the American Colonization Society’s plans to settle the area with ex-slaves, and 3) the concerns of the British Government about those plans, came into uneasy interaction in the 1820s. This conflict was finally resolved in 1827 when Jehudi Ashmun, an ACS representative came to the Pongo to survey the area and meet with local leaders. Ashmun’s report listed the river valley’s advantages and its disadvantages. Ashmun concluded his report with two questions that summarized his reservations about the settlement scheme. First, would it be in the best interest of the ACS, the potential black settlers, and the U.S. government to avoid antagonizing the British by setting up a separate colony north of Sierra Leone? Secondly, would it be wise to establish a colony of ex-slaves in an area where plantation slavery was taking root? Ashmun answered both questions by recommending against a permanent settlement of African Americans along the Rio Pongo.